The advice and structure given in this article will teach you how to write a thesis proposal for master courses, how to write a thesis proposal undergraduate courses, and how to write a thesis proposal for PhD courses. We at Paper Writing Pro Service know, that they mostly follow the same structure as the one listed below, but each has its own level of detail and work required. 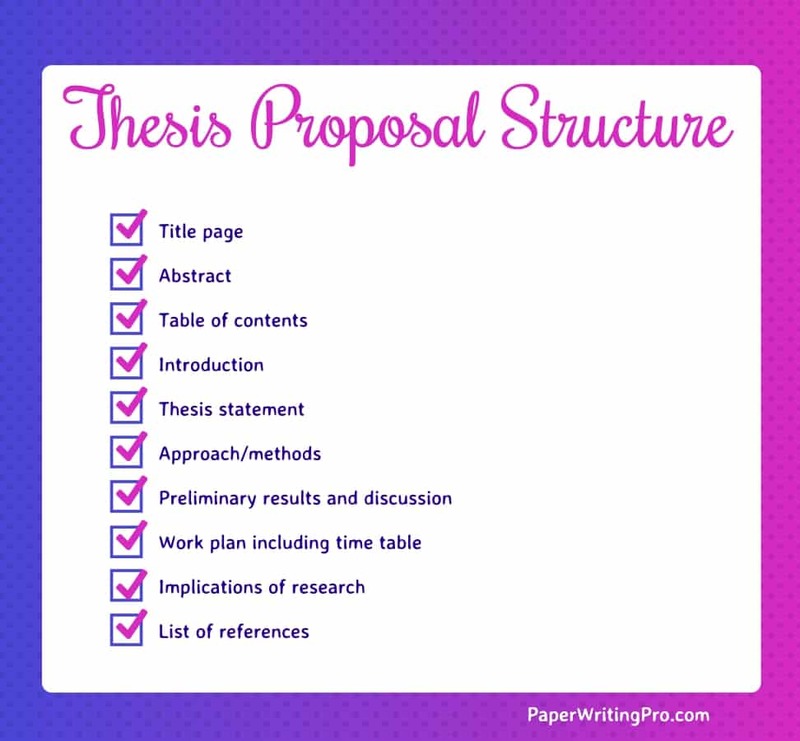 If you want to know how to write a thesis proposal, here is the general structure you will have to follow. Student Tip – Once your thesis proposal is complete, keep it on file because you can use a chunk of it for your thesis or your scientific paper. Do not confuse an abstract (a brief summary of your work) with an extract (a meaningful part of your essay). Consult your professor before completing your table of contents because some institutions like you to add tags or links that work with their word processor programs. Student Tip – Professors will typically give people higher marks if they give a broad picture that narrows into what the proposed thesis is about. Student Tip – Do not discuss your actual results, do not include anything related to the discussion of your results. Discussing these things in this section is a common way to limit the marks you get so that you cannot score higher marks on your paper. Leave any mention of results for the next section. What knowledge will your research unearth? Is that knowledge already unknown? Can you prove the limitations of current knowledge and prove how your results will advance current knowledge? What are the implications of your research if it is a success? Why is it worth knowing? Student Tip – Spend unholy amounts of time on this section because it is a massive marks earner. If you can somehow prove the current limitations of knowledge, you will get big marks, and if you can show how your work will advance current knowledge, then you will get even bigger marks. Student Tip – Be very careful when answering “Why is it worth knowing?” because most students offer weak-but-passable reasons. For example, your proposal may revolve around counting slugs and their movement in a small area to try to explain why their numbers fluctuate during the year. You still need to answer the question of “Why should people care?” If slug numbers were dwindling, then that may be a reason, or if their predator numbers were decreasing, then that may be a reason to care. Your college and/or professor will give you the guidelines for references and your bibliography. If you are still stuck, and/or you want to know how to write a thesis proposal for master or how to write a thesis proposal undergraduate, then get in touch with the PaperWritingPro Service and let them write your paper for you. Not only will you see how a professional writes a thesis proposal, you are also more likely to have it approved. The degree-qualified staff have already completed the course and qualification you are taking, so they know exactly what it takes to have a proposal approved. Prev When Editing Your Paper, What Should You Focus on? Next What do You Know About Student Self Serve Program?